No compensation was received for this post. A complimentary review copy of the book was provided for the purpose of sharing a review. All opinions expressed are my own or that of my family. As I have mentioned before, I really love the chance to continue the story of the characters that I meet in novels. I think that is one of the reasons why I really enjoy reading book series by authors like Susan May Warren. Susan has a whole series of stories around the Christiansen family - in each book, she focuses on one or two of the family members, but the others are also part of the story (which makes sense since they are all in the same family). It is so nice to have a continuation of the previous story, even if only in the background of the main story. 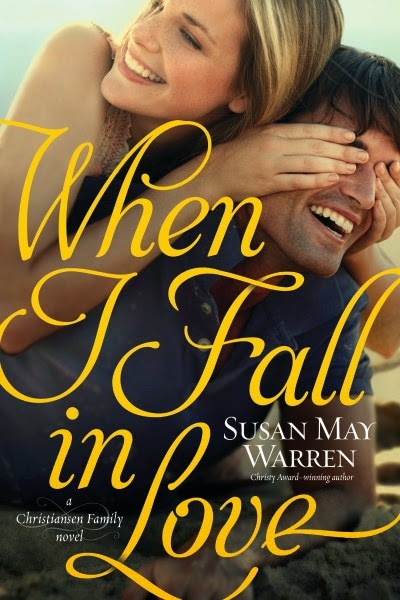 I was excited to see that When I Fall in Love, the third book in the Christiansen family series was available for review. For me, it is the second one that I have read and it did not disappoint. (I still need to find a copy of the first one to read.) This book was focused primarily on Grace Christiansen, but also spent a good amount of time with the story of Casper. The story in many ways was about learning to live. It was about having faith and allowing yourself to be open to the path that God has for you. After catering her older brother's wedding, Grace is given a trip to Hawaii for a cooking school by her family. Her sister Eden, suggests that she can learn to cook Hawaiian food and then help cater her wedding later that year. Grace is reluctant to go, but ultimately makes the trip. A bad flight is almost enough to cause her to hole up in her room or simply head back home, but for Max, a former teammate of her brother Owen, he won't let that happen. Won't allow her not to pursue her dream, because in his mind 'everyone who gets to have dreams should reach for them.' The irony being that he is so good at encouraging her to pursue his dreams, when he won't allow himself to dream. In exploring Hawaii and learning to cook with Max, Grace learns a lot about herself and when he leaves, learns about her relationship with God that leaves her with a deepened faith. It was a very good story and well written. The characters are well developed, through both their personal reflection and the observations made by those around them. As was the case with the last book that I read by Susan May Warren, I found myself becoming attached to the characters and cheering them on from my seat. I really enjoyed the story and can not wait for the next installment in the Christiansen family series.